The frenzy generated around the letter that Benedict XVI sent to the funeral of Cardinal Joachim Meisner, Archbishop Emeritus of Cologne, and his longtime friend, reveals much of what the Church has become and, in particular, how divisive the internal debate in the Church has become. These words were immediately interpreted as an attack on the current pontificate. Suspicion was also spread that the letter was not written by the Pope Emeritus, but by his collaborators. Harmful innuendos! Archbishop Georg Gaenswein, Prefect of the Pontifical Household, but above all Personal Secretary of the Pope Emeritus, dismissed everything: Benedict XVI was not referring to any particular circumstances, nor he was criticizing the current pontificate. Looking at the facts, this version must be believed. Pope Benedict employed the metaphor of the barque many times to describe the life of the Church. We could go on, documenting step by step how and when Pope Benedict compared the Church to that little boat in the sea of Galilea, that first cell of the Church made of the apostles that is now the beating heart of the Church. 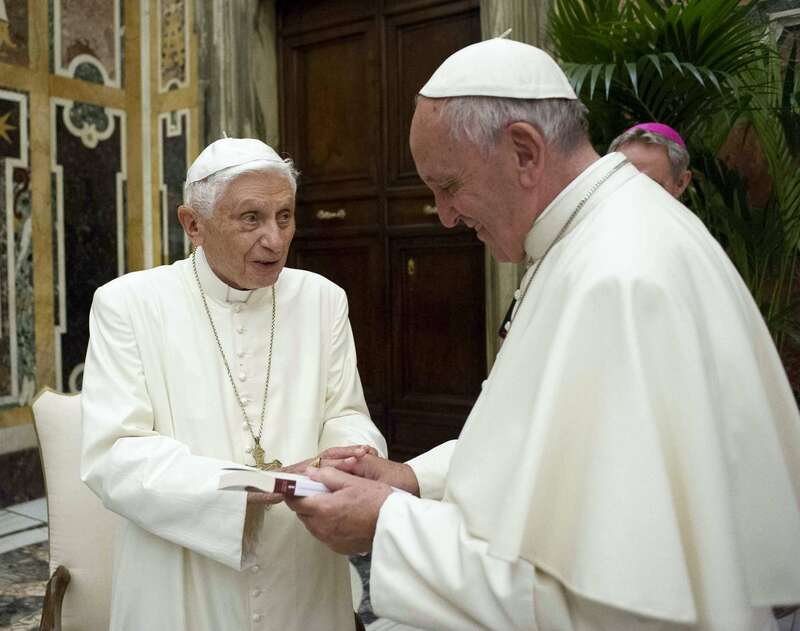 To clear up any lingering suspicion, it should be enough to look at the obedience, reverence and even affection Benedict XVI has shown to his successor. The two had an almost intimate relation, and Benedict almost seems to be Pope Francis’s “hidden advisor,” always ready to meet Pope Francis’s requests. In the end, all these discussions seemingly come from people who only know Benedict XVI a little, people who do not take into consideration his refusal to advance personal criticism, especially against his successor, people who do not understand that Benedict always goes to the core of things, beyond circumstances. However, perhaps the problem is a different one. 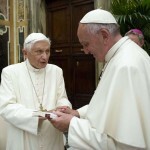 These polemics could originate from the fact that everyone knows Benedict XVI’s thought very well. During the eight years of his pontificate, and even before that, Joseph Ratzinger, both as Prefect of the Congregation for the Doctrine of the Faith and as a theologian, always worked for a synthesis. He always steered clear of easy counter positions that biased the debates following the Second Vatican Council. In his way of thinking, there is no “political way,” but merely the search for the will of God. His speech on the hermeneutic of continuity, delivered to the Roman Curia at Christmas 2005, went in this direction. In the end he invited everyone to leave aside political categories, and to enter the heart of the mystery of the Church. To sum it up, Pope Benedict asked his audience always to use the renewed glasses of faith to look at reality. This approach was rejected by those who made ideological counter positions the main theme of their work. For this reason, they were marginalized during Benedict’s pontificate. Under Pope Francis, they grabbed the occasion to retake the reins of the cultural debate. Under Pope Francis, and probably despite him, the debate is really similar to that of the 70s: nuances are marginalized, issues at stake are framed in political language, the theme of faith is kept in the background. For this reason, anytime the impression is given that Benedict still has something to say, his thinking is violently marginalized. It happened many times. For example, when Archbishop Gaenswein spoke about an “enlarged Petrine ministry” with an “active member and a contemplative member,” his words were immediately labeled as harmful to papal primacy. It also happened when Benedict XVI’s foreword to Cardinal Robert Sarah’s latest book, a foreword that praised the Cardinal, produced a request on the part of some for a regulation that would bring about “the institutional death” of the title and role of “Pope Emeritus”. Obviously, Cardinal Sarah does not figure in that La Civiltà Cattolica essay which, instead, offers a series of affirmations in political language, tries to take a snapshot of reality through secularized lenses and does not understand how the defense of traditional values is shaped and why Christian denominations can find a common cause with respect to these values. In the end, one can lament the lack of nuances and ask the authors to look at reality with a more complex vision, one that goes beyond ideological counter positions. Here’s the point: the article in La Civiltà Cattolica mirrors the current discussion. And it is the current debate that is “Manichean” by nature, as it depicts the Church as being divided between “pro-Francis” and “anti-Francis” parties. Everything said in today’s Church is demonized if it is not in line with the mainstream view that made the decision to describe Francis as the Pope of the poor, of the peripheries, of a social Church that does not want to evangelize. It is not important that the same Pope Francis always stresses that the Church is not an NGO. In fact, the same Pope uses a lot of political and sociological categories in his speeches – as is normal in Latin America, where politics and theology are always fused, and where attempts to bring everything to faith are not aimed at explaining the reasons of faith, but rather at the exaltation of popular piety, as the Theology of the People that Pope Francis loves. In this climate, it does not seem to have happened by chance that the report on the abuses perpetrated in the College of the Children’s Choir of Regensburg – the famous Domspatzen – was published only this past week, although the report was ready for release since February, and its publication was postponed many times. The report names no names, and does not directly involve Monsignor Georg Ratzinger, Benedict XVI’s brother, who was director of the choir for decades. The report is about the college, not the choir. However, the publication of the report was used to put the spotlight on the brother of the Pope Emeritus, and at the same time to attack Cardinal Gerhard Ludwig Mueller, Prefect Emeritus of the Congregation for the Doctrine of the Faith, and former Archbishop of Regensburg – as if the Pope’s decision not to renew his mandate as Prefect was linked to an alleged failure to address the abuse crisis during the time Mueller was a residential bishop. In the meantime, the center of power that originally targeted Pope Benedict XVI has again sprung into action. The “hidden directorate” behind the first Vatileaks scandal is again leaking documents, in order especially to highlight scandals surrounding the immorality of the Curia. At least three stories published in the last month seem to be part of a plan of character assassination that has little or nothing to do with the current pontificate, except to defend the theory that everything has changed with Pope Francis, and that everything needed and still needs to be changed, because the Curia of the past was full of corruption. But as Pope Francis contemplates dismantling or reshuffling the old structures, some people around him, who adhere to a precise agenda, want to bring back to life earlier schemes that were seemingly set aside. Whoever criticizes these re-proposed schemes is labeled a “hate speaker.” Is there, in the end, any possibility to dissent from this mandatory line of thinking? The theme of the dictatorship of relativism has thus returned to the center of the debate. This dictatorship asks the Church not to surrender its principles, but to give up talking about them in the public sphere; it asks not that the Church should quit evangelizing, but that it should avoid speaking explicitly of Christ; it asks not that the Church remain silent, but that its speech should be drawn from a secular vocabulary. In the end, it is useful to look back to another moment in which Benedict used the metaphor of the barque of Peter. It was April 18, 2005, and Cardinal Joseph Ratzinger, Dean of the College of Cardinals, was celebrating the Missa Pro Eligendo Romani Pontifice prior to the conclave which elected him pope. Cardinal Ratzinger went on: “Every day new sects spring up, and what St Paul says about human deception and the trickery that strives to entice people into error (cf. Eph 4: 14) comes true. Today, having a clear faith based on the Creed of the Church is often labeled as fundamentalism. Whereas relativism, that is, letting oneself be “tossed here and there, carried about by every wind of doctrine”, seems the only attitude that can cope with modern times. We are building a dictatorship of relativism that does not recognize anything as definitive and whose ultimate goal consists solely of one’s own ego and desires”. But – the Cardinal concluded – “We, however, have a different goal: the Son of God, the true man. He is the measure of true humanism. An “adult” faith is not a faith that follows the trends of fashion and the latest novelty; a mature adult faith is deeply rooted in friendship with Christ. It is this friendship that opens us up to all that is good and gives us a criterion by which to distinguish the true from the false, and deceit from truth. We must develop this adult faith; we must guide the flock of Christ to this faith. And it is this faith – only faith – that creates unity and is fulfilled in love”. His words were prophetic – they explain the current issues and also the reason behind many attacks: there are really only a few people capable of having a faith fed by the measure of the Son of God.